This version is no longer available. Find out more about our latest version. 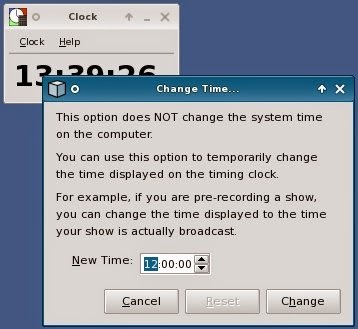 Originally designed for broadcasters, you can use the Timing Clock in any other situation that requires these features, for example public speaking. 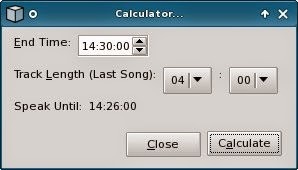 The Timing Clock is available for Windows and Linux. 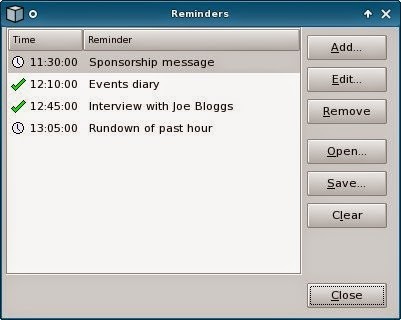 Improvements in version 2 of the Timing Clock include: a version of the software for Linux, improvements to the design/layout of reminders, a countdown timer option and remembering whether the “always visible” option is selected. Available free of charge, the Personal Edition runs for up to 2 hours each time and displays a message when you start the application. Consider upgrading to the Commercial Edition to remove the personal edition's limits, remove the personal edition message, receive product support and 12 months of updates. You will also be supporting further development of the Timing Clock and other applications. This version is no longer available. Click here to find out more about the latest version of Timing Clock.